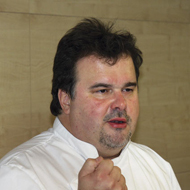 Worldwide reference pastry chef, owner of the Pierre Hermé bakeries, to be found in different continents. Pierre Hermé needs no introduction. His charisma and contributions to pastry turn him not only into a worldwide reference figure, but the figure everyone wants to find a reference in. He has establishments in France, England, Japan, United Arab Emirates and Hong Kong, besides a successful on-line store, and his pastry empire does not seem to cease from growing. But above all, Pierre Hermé is a tireless creator, capable of imagining a new pastry in which pleasure turns into a guide. 1997 – Publication of ‘La Pâtisserie de Pierre Hermé’. 1998 – Opening of Pierre Hermé Paris and a store in Tokyo. 2002 – First store in Paris. 2005 – Publication of ‘ph10’. 2010 – Publication of ‘Pierre Hermé Infiniment’. 2011 – Publication of ‘Rêves De Pâtissier – 50 Classiques de la Pâtisserie Réinventés’.